Customize this marble set with pictures of anything from special vacations to baby's first year. Photo albums may only come out when we're feeling nostalgic, but these coasters? They're always out, letting you re-live favorite memories every time you sip. Customize the set with pictures of anything from an epic trip to baby's most irresistible moments. 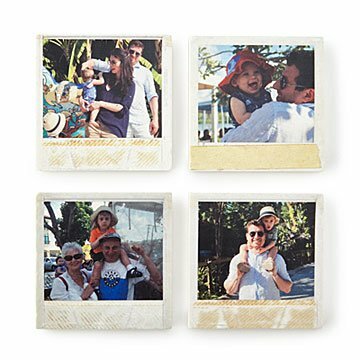 With a touch of instant camera-inspired style, each image is printed onto a square of tumbled marble with cork backing, making them a thoughtful gift for grandparents, new parents, or the friend who always says "yes" to a crazy adventure. Made in Providence, Rhode Island. Optimal photo size is 3x3 at 300 dpi. Non-square images will be cropped according to the smallest dimension for best fit. These can be used as decor or use them as any coaster! Everyone's Getting These For Christmas! Well made and attractive coasters. I know all my friends are going to love them! This is a wonderful and unique gift. Please note that they do not provide a proof so be careful when ordering. Mine came out great! I have now ordered 4 sets of these coasters for Christmas gifts for different members of my family and they are beautiful!